I have two colanders and, until recently, one was plastic. The other is an over-the-sink model like the one pictured here. I used the plastic one for draining everything from spaghetti to cooked vegetables. 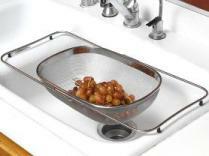 The over-the-sink model is great when I am prepping fruits and vegetables. It is very convenient to have it drain directly into the sink where I am working. Most plastic models, like the one pictured to the left, work fine for most things. If properly taken care of and not over-loaded they will last a surprisingly long time and you can't beat the price. But after a number of years of service, I retired "old faithful" and purchased a 5 quart stainless steel model. It is pictured on the right. America's Test Kitchen rated this one the best. One of the reasons is because it has numerous holes for draining quickly. It is stable and very well built. I doubt I will ever need to purchase another. These kitchen tools are made of all kinds of material from plastic to stainless steel to copper to steel with enameled finishes and they come in a large variety of colors. My sister has cookware with copper trim so she bought one with a copper finish like the one on the left. Yes, it works and it is gorgeous. Some people, like my sister, use these attractive ones as display pieces when not in use. the number and size of the holes it has. Think about the volume of food you normally prepare to get to the size you need. Look at its base. Is the base designed to stay stable under weight? Then look at the holes. The greater the number of holes and where they are positioned will determine how well your strainer will perform its basic job of draining. Did you know? 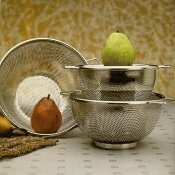 Actually colanders are for draining a liquid off a solid, whereas strainers (or sieves) are for getting solids out of liquid.